I am thinking about bleeding my catch before I put them in my fish bag to see if that might help make the meat taste better. Do any of you do that for your catch, and if so, have you found it helpful, or just a messy pain in the arse? I only know of one guy who bleeds inshore fish (reds/trout/flounder), but he claims it produces a better meat. I've seen photos of my grandpa's stringer from the 50's where it looks like they bled their speckled trout. I dunno, I don't want to deal with it, so I don't bleed my catch. I just use a stringer and fillet as soon as I can. But bleeding probably does make a difference. A couple days in the ice-water bowl definitely improves fillets, and the whole point is washing out blood and bile. learned this from my guide buddy Tim who always threw his fillets in the ice chest in the garage with floating ice, and didn't mess with them for several days. I don't bleed mine unless I have little to no ice to keep them cold enough. Usually does not make a difference in the taste of the meat in my experience. I would say bleeding is better but keeping them alive on a stringer then bleeding them at the ramp might be worth it. I think it does help on larger fish. On upper end slot reds and drum I'm a firm believer in bleeding them. On catfish if I want to keep a bluecat or flathead over 10 lbs I'll always bleed them out. But doing so means you need to keep them cold until fillet time. Regardless of bleeding or not I think trimming away all of the red or dark meat off the filets will go a long way in making the fish taste great. If you ice the fish immediately -- most of it's blood will accumulate in it's abdomen (it is some sort of natural reaction to survive cold conditions). This removes the need for bleeding for most fish. I tried bleeding reds and didn't notice any significant change (both bled and non-bled fish were immediately put on ice). I suspect that it may matter for bigger fish because it likely dies (heart stops) before ice lowers it's body temperature. Thanks for posting this as I have been wondering about it. I usually bleed my fish and throw them on ice in my cooler. Sometimes it’s hard to wait so my cooler ends up looking like a blood bath. I was thinking about bleeding it on a stringer and then throwing it in the cooler. But after reading that article I wonder about more contamination, and of course possibly attracting something that might like my fish for dinner. I’m also always looking for less cleaning, both fish and boat/equipment when I get home. Is that even possible!? In my experience bleeding your specks & redfish doesn't improve the taste. But those few times I've caught Spanish Mackerel in the surf, I have bled those oily fish to render them edible. Many don't eat them, but they're pretty good if bled & cleaned. I do sometimes since the fish are still alive when I fillet them. 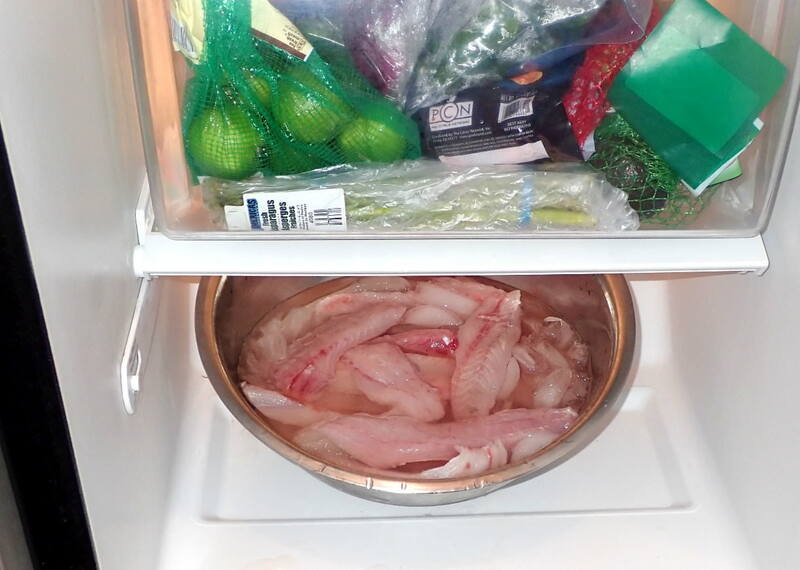 Other times, the whole fish have been on ice for a while before I fillet them. I can’t tell the difference on taste. But I don’t ever have dead fish on a stringer unless they are on ice and I don’t put fish in a box or bag unless it’s got ample ice. Live fish either go immediately on ice or I fillet them alive. Thanks for the helpful comments, all. I use a fish bag (affixed to the top of the front deck of my Hobie Outback) with one to two blue ices to hold the fish, so complete icing is not an option for me. (My trolling motor battery and related electronics are stored in the hatch, so no room there). I don't like dragging around a stringer, so I have found the fish bag to be the best for me. I might try an experience where I bleed one redfish and not another, and see the difference. I have bled trout off and on for years. I won't do it in sharky waters wading and it isn't a good idea unless you do it soon after you catch them and put them immediately on ice. Do not bleed them (kill them) and then leave them on a stringer for another hour. If I am in a boat when I catch them and we aren't in them thick, I'll take the time to put them on the Boga, slit their throat and let them bleed out in the water. It takes about 20 seconds. Then I put them on ice. The biggest advantage is in the color of the meat - no pink to them at all. There is a slight difference in taste. I taste tested the difference on my girlfriend. On a trip to the surf, only the last 4 fish were still alive enough to bleed fully. Their meat was noticeable different when I cleaned them. I put the bled fish in a separate pile and fried them separately. I asked her to taste two fillets and she preferred that which had been bled. So did I.
Dandydon wrote: In my experience bleeding your specks & redfish doesn't improve the taste. But those few times I've caught Spanish Mackerel in the surf, I have bled those oily fish to render them edible. Many don't eat them, but they're pretty good if bled & cleaned. A lot depends upon personal taste. Try it both ways and see if it makes a difference. I'm one of the few people who like the dark meat next to the skin. It's a stronger, gamier flavor some dislike, others find interesting. The same is true for jalapenos. Some relish the heat, others can't understand the appeal. There's no accounting for personal taste.